WAREHAM, Mass. – Following a 1-0 victory on Tuesday afternoon, the Wareham Gatemen came home on Wednesday in an effort to secure their ticket to the CCBL Championship Series by beating the Cotuit Kettleers. 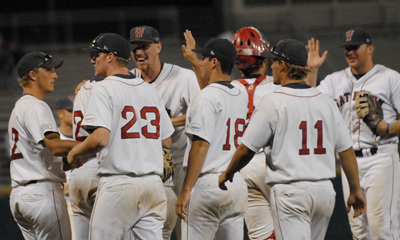 With the help of an impressive display of hitting along with a remarkable pitching performance by Riley Boening (Texas), the Gatemen recorded a 5-0 win to advance to the final series for the first time in four years. In front of a jam-packed crowd of over 4,200 people, Boening pitched the most incredible game of the season for the Gatemen. With a three-run third inning and a couple insurance runs on top of that, the Gatemen earned more than enough runs for Boening in his complete-game shutout effort. In his second complete game of the season, Boening was the highlight of the night, allowing just one hit over the first three innings. The game experienced a 50-minute delay due to power failure after Boening’s third inning of work, but he returned from the break throwing stronger than ever, retiring the next 18 batters he faced. He allowed just one out of the three hits given up to reach the outfield while striking out 14 batters in all. The power-hitting offense of Cotuit was put to bed in the series sweep, scoring no runs in two games. Top prospect Justin Smoak struck out three times in four plate appearances, adding to Boening’s total. Boening’s velocity grew stronger as the game went on, and the energy at Spillane Field grew along with it. Leading the Gatemen offense was Dominic de la Osa (Vanderbilt) with three hits, including a timely double in the second that sparked the three-run rally. Bradley Suttle (Texas) and Joel Collins (South Alabama) walked in the frame and were driven in on singles by Jason Ogata (LSU) and Beemer Weems (Baylor). Coach Mike Roberts of Cotuit went to the bullpen early after starter Jay Brown (Young Harris) loaded the bases in the second. In the “win or go home” scenario, Roberts was forced to bring in an array of pitchers throughout the game. Starting in the first two innings with four men left on base, all of whom were in scoring position, the Gatemen witnessed routine hits being taken away from them by the Kettleers defense. 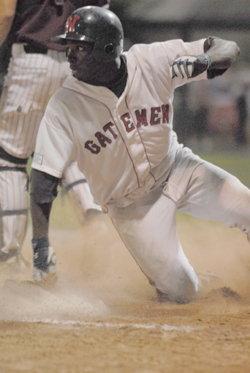 However, with patience at the bat and a strong pitching performance, the Gatemen were able to take two games from the Kettleers in the best-of-three playoff series, earning their trip to the Championship.